Katy, TX, October 06, 2018 — Inf4College, an orientation service that has been helping the Greater Houston surrounding areas high school students and their parents with the college application process for the past six years, has moved to a brand-new location on 612 South Peek Road in Katy. The new office is now officially open for business after a ribbon-cutting ceremony held on Saturday, Sept 22 with the presence of friends and families of Inf4College. Master of Ceremony Dayin Santamaria kicked off the event by introducing the representatives of Inf4College, who then proceeded to cut the ribbon. Following this, Deacon John Milton blessed the premises and Ysabel DaCosta and Teresa Garay made a few remarks. Guests were then invited to tour the facilities and sample a rich variety of appetizers. 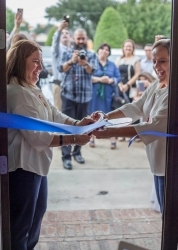 “This is an important milestone in the life of Inf4College and a testament to both the trust of parents and students, and the importance of the service that we provide to the community,” said owner and co-founder Ysabel Da Costa. “We started out meeting at public libraries and cafes. It is incredible to see what has been accomplished in such a short time,” added co-founder Teresa Garay. Inf4college offers multi-year orientation, providing high school students and their parents with the tools necessary to make informed choices and meet deadlines, as they advance through the often cumbersome college application process.